This is the product listing for the Tein Street Advance Z for 91, '95 Honda Civic / Integra type R manufactured by Tein. Part Number GSH48-91SS2. The Street Advance Z uses the latest tech advancement by Tein to deliver a comfortable ride with height and dampening adjustable coilovers, at an affordable price. 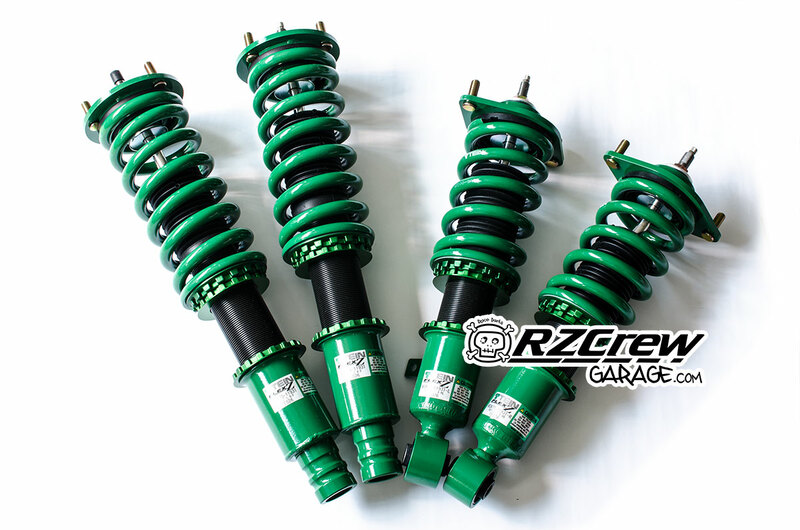 These coilovers are made for comfortable street use, and spirited road driving. The Street Advance Z adopts Tein's new "Sealed Structure", which has faster production time and costs, allowing the sales cost of the coilovers to be as low as possible. EDFC compatible (EDFCII, ACTIVE and ACTIVE PRO) for remote electronic adjustment of the dampening via commands in the cabin. Powder-coated with Tein's signature green, and coated with "ZT-Coating" to keep rust at bay, making them ideal for people living in snowy areas or near the sea. Manufacturer's 3 years warranty from purchase, within the range of 60,000Km from installation. Seen it cheaper? We price match! Order before 9:00am Monday 22 Apr 2019 to be included in the next order to Japan. The price includes shipping from Japan to the EU and all EU taxes! Nothing further to pay. All products listed on IHH can be shipped within the UK and EU. If you require a price for an item and you are outside of the EU please contact us with the items you are considering. We will then price the items for you. The price will include shipping from Japan to your country. Further taxes may be charged by your government. Please familiarise yourself with these charges before ordering. Who do you ship with? Goods are shipped from Japan to the United Kingdom via either EMS, DHL (Air Freight) or DB Schenker (Sea Fright). What about within the UK or to Europe? Shipping within the UK is handled by UK Mail, Hermes or DHL. Outside of the United Kingdom is handled by either Fedex or DHL. All products sold by I ❤ Honda are guaranteed to be 100% authentic and genuine. All of the products listed on this site are manufactured to the highest of quality standards. If you have any concerns over product authenticity, quality or lead times please don't hesitate to contact us. I ❤ Honda has a proud and ethical history of only ever selling authentic and genuine products from the top brands and manufacturers. We have never sold an illegal copy of any product. Brands that invest heavily into new products for our cars do so in order to increase your driving experience. Without these brands and their forward-thinking approach we'd simply have no performance parts to add to our cars. We urge all enthusiasts to consider this when purchasing products. To find out more visit our Please buy Genuine page. TEIN, Inc. is a worldwide company with facilities in Japan, United States, and United Kingdom. Each facility is capable of complete product sales, support, and R&D. 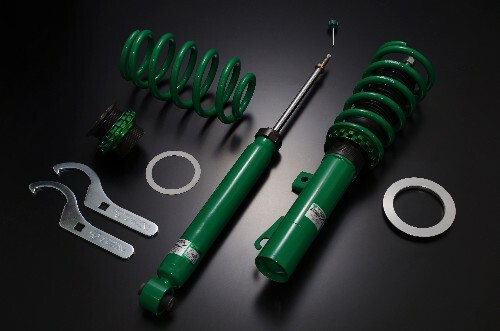 All TEIN lowering springs and coilover are manufactured and assembled in their factory based in Yokohama, Japan. 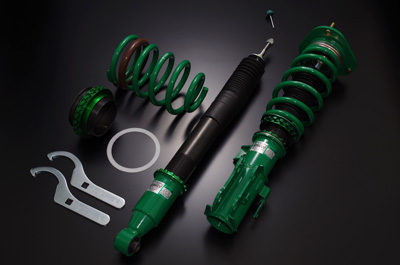 What sets TEIN apart from other competitors is our dedication to suspension components. TEIN develops specific product specifications for the different regions based on consumer demands, road conditions, and vehicle specification. This means that our consumers get the best possible product for where they live, and how they drive. Each of our facilities performs R&D and test fitment locally to ensure the best possible ride, performance, and durability for all our customers. All Tein products are shipped with an I ❤ Honda Certificate of Authenticity. You can also re-print this by logging in to your account and viewing the PDF Invoice/COA. We are here to help. No matter how trivial, feel free to make contact! We'll be happy to assist! I ❤ Honda! has a unique pricing system which is automatically updated every 5 minutes from real time exchange rate data. This means there is no awkward email asking for more € for parts because the exchange rate has dropped since the website was last updated. We felt this was a vital tool for our website as 99% of our products are sourced in Japan. We can supply parts for all Honda vehicles including the FR-V, HR-V, CR-V and rare imports such as the Stream, Odyssey, Element, Life and even the legendary NSX. All prices include import duty/VAT for UK and EU customers. For customers outside of the EU (US, Canada, Australia, New Zealand, Singapore and South Africa) import duties and taxes may be payable to your government. PayPal automatically encrypts your confidential information in transit from your computer to theirs using the Secure Sockets Layer protocol (SSL) with an encryption key length of 128-bits (the highest level commercially available). Before you even register or log in to the PayPal site, our server checks that you're using an approved browser - one that uses SSL 3.0 or higher. The I ❤ Honda! website uses the latest technologies (HTMl5, CSS3, Boostrap, Jquery). © I Heart Honda 2013-2019. All right reserved.